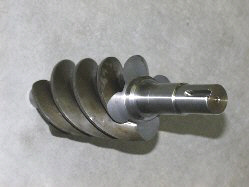 An Airend rotor designed with sealing strips suffers a dramatic loss of efficiency when these strips are scrubbed off during an airend failure. 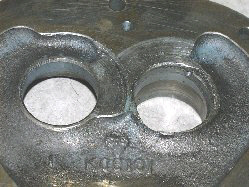 In addition to the loss of effective sealing between the rotors, the critical rotor to cylinder clearances may increase by a factor of ten or more. Rebuilding such an airend without replacing these strips is like running an engine without piston rings. "Grinding off the high spots" will simply not do. 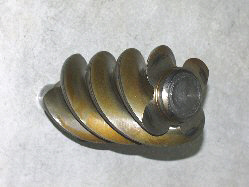 We replace broken rotor shafts in all types of airend rotors with heat treated stainless steel. 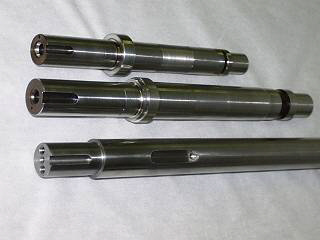 Our replacement shafts generally have tensile strengths 2 to 3 times stronger than the OEM material and are very tough. 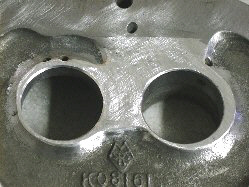 We can machine them to OEM dimensions or fit them to your specific needs. We have successfully replaced shafts in hundreds of rotors in airends from 15 to 1000 horsepower. 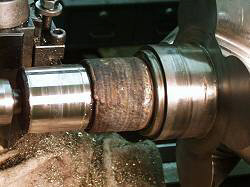 Due to heavy side loads, we replace rather than repair most badly damaged belt driven rotor shafts. These replacement shafts do not break and will not come out with normal use. 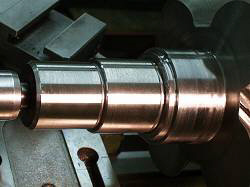 For those less dramatic shaft repairs, our ASME certified welders use tungsten and inert gas equipment for seal area, bearing and gear surface buildups, not spray welding or even knurling as do some of our competitors. Tig welding, although slower than mig or stick welding offers us better control of the heat affected zone normally responsible for shaft breakage next to a weld. 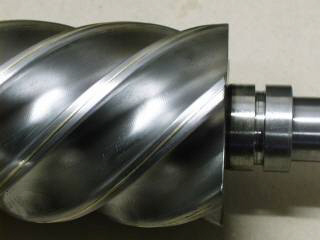 Air Compressor Technology, Inc. specializes in the repair of damaged castings with a combination of state of the art materials and the experience from years of casting manufacture and repair. We can disassemble most seized airends without casting breakage or distortion.